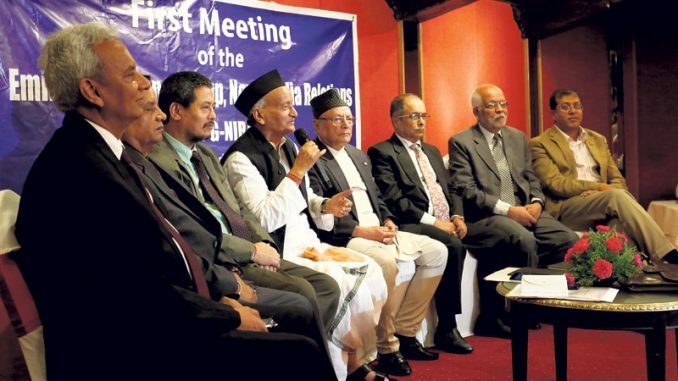 The Nepali members of the Eminent Person Group on India-Nepal relations plan to recommend a new peace and friendship treaty with India and replace the existing one signed in 1950. The Nepali side of the EPG is of the view of that the positive aspects of the present treaty should continue and suggested avoiding or not mentioning while writing the new one. The seventh meeting of the EPG begins Saturday in Kathmandu. Members will discuss preparing a common template for a joint report to be submitted to both the governments. The status of 1950 Treaty of Peace and Friendship between the Government of India and The Government of Nepal) will be a major cornerstone of this report. First, according to the Nepali side, the two sides will prepare their respective reports. On completion, a joint report will be prepared as mandated to the EPG that is tasked with suggesting a new blueprint for bilateral ties in changed domestic, regional and global contexts. In the 1950 Peace and Friendship Treaty, the provision of security and providing reciprocal treatment to the citizens by both countries is a major concern for Nepal and it wants to replace them, said a Nepali member who attended all six meetings in the past. Mainly the Nepali side, following suggestions from various stakeholders, is of the view of having new content for Articles No 2, 5, 6 and 7 of the Peace and Friendship Treaty. Article No 2 talks about informing each other of any serious friction or misunderstanding with any neighbouring State that is likely to cause any breach in the friendly relations subsisting between the two governments. Article No 5 says the Government of Nepal shall be free to import, from or through the territory of India, arms, ammunition or warlike material and equipment necessary for Nepal’s security. The procedure for giving effect to this arrangement shall be worked out by the two governments through mutual consultation. Articles No 6 and 7 talk about providing equal treatment to citizens of the both countries with regard to participation in industrial and economic development of such territory and to the grant of concessions and contracts, relating to such development, matter of residence, ownership of property, participation in trade and commerce, movement and other privileges of a similar nature. The EPG has to submit one joint report to both governments whose term expires this July. The upcoming 7th meeting in Kathmandu will discuss and come to an understanding on developing a template on writing a report that will give policy suggestions to both governments in socio-economic, culture, peace and friendship treaty, boundary, border management, economic cooperation, and water resources. Both sides have already prepared their reports, putting inputs and recommendations received from stakeholders. The sixth meeting in New Delhi had agreed to expedite report-writing from both sides ahead of coming to a conclusion. If there is no dispute or controversy, this meeting in Kathmandu will agree on the content for a common report where both sides will exchange drafts prepared by either side before coming to a final conclusion, said officials. Firstly, both sides have already prepared their own separate reports based on inputs taken from various stakeholders. Then they would sit together with their respective reports and discuss contents of the report and come to an agreement before developing one template. Apart from formal meetings, the members of EPG are also holding regular informal meetings and exchanging their views on a regular basis. This time, only three Indian members will attend the meeting since from former Indian Ambassador to Nepal Jayanta Prasad cannot attend due to health reasons. He recently suffered cardiac episode. His doctors advised him not to travel by air.